The Joyce Daze Wild Blackberry Festival Beard, Moustache, and Goatee Contest is set for Saturday, August 2, 2008, in Joyce, Washington, located on the Olympic Peninsula just west of Port Angeles. 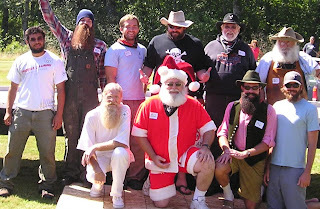 Pictured here are last year's competitors in the full beard division. Registration is from 10 to 11:30 a.m. and costs $5. The contest judging will be at 11:30 a.m. This year's judges include Jeff Well and Guy Thompson, both of whom placed at the 2007 World Beard and Moustache Championships in England. In addition to the beard contest, the festival features a parade, a salmon bake, a wild blackberry pie contest, antique cars, and lots fun all day long. For more information see http://www.joycewa.com/joycedaze.htm or contact Jane Childers (jchildj@gmail.com). I'm ready to see Brent take home an axe this year after training hard all summer! See you Saturday . . .